Our daughter cooked us a slightly modified version of Green Curry from Jamie’s 30 Minute Meals. It had typical Thai flavours and we opened a couple of bottles of Brancott Estate Marlborough New Zealand Sauvignon Blanc 2010 from Costco. This reliable New Zealand white delivered tropical fruits with citrus lemon and an acidic edge but it was still smooth. A good match with the meal. 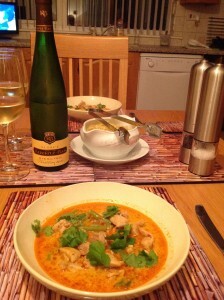 For a quick midweek meal we had a Thai Jungle Chicken Curry made with a jar of spice paste. 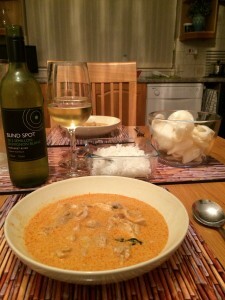 The ingredients contained a typical mix of Thai spices but without coconut milk, so we thought a dry rather than off-dry white would be a better choice. We found the curry to a bit mediocre, especially in comparison with some of the excellent meals made with Green Curry pastes that we have had before. The wine pairing was also only average. 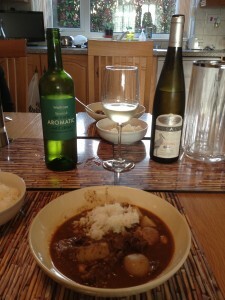 We opened a bottle of Westend Sauvignon Blanc 2009, an Australian white from the Sunday Times Wine Club and last tasted on 15 January with a Chicken Tagine. Whilst we enjoyed the tropical fruits and citrus flavours from the wine it didn’t taste as good as with the Tagine. We enjoyed a lovely Thai Green Chicken Curry with potatoes added and served with stir-fried vegetables and rice noodles. I have written in previous blogs about how we particularly enjoy off-dry Australian Rieslings with this dish. However, we didn’t have any. Instead we turned to a bottle of De Bortoli Unoaked Verdeho 2009 from the Sunday Times Wine Club. We enjoyed a previous bottle of this wine with another Thai dish (see 3rd June 2011) and we agreed that the lime and citrus flavours went just as well with the curry. Nevertheless, we still believe an off-dry Riesling is a slightly better match. We had the rest of the Thai Green Chicken Curry from the previous evening, augmented with some more coconut milk and spices. We like a lot of sauce. We decided to pair it with a New Zealand Sauvignon this time. A bottle of Montana Marlborough Reserve 2010 from Costco. Warning! I think we served this too cold, because we both thought the flavours were a bit muted at first. As the wine warmed a bit the ripe tropical fruit flavours came to the fore, but it still retained a crisp, clear finish. 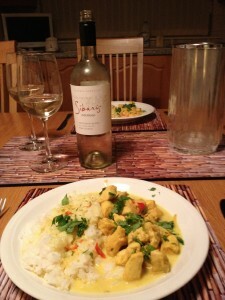 We thought it was a very good match with the curry, but not quite as good as the Sauvignon/Semillon we had yesterday. We cooked another of Rick Stein’s recipes from his excellent Far Eastern Odyssey. This time Stir-Fried Green Chicken Curry accompanied by rice noodles. Lovely recipe, full of typical Thai flavours. 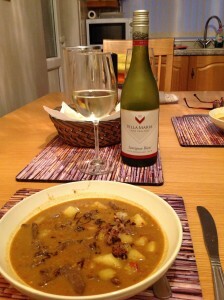 Some say Thai Green Curry pairs well with Aussie or New Zealand Semillons, Sauvignons or combinations of both. 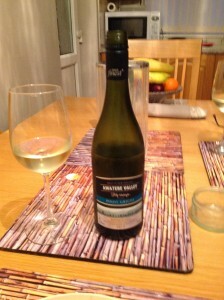 We enjoyed it with a bottle of Westend Estate Riverina Sauvignon Blanc Semillon 2009 from Sunday Times Wine Club. This white delivers aromatic, tropical fruits, together with lemony citrus flavours and was delightfully citrussy and creamy with the curry.